William Meadon explains how investment trusts can provide investors with a level of income certainty. As well as providing an attractive double-digit capital gain in 2017, the UK equity market also provided handsome income growth to investors. UK dividends jumped 10.5% to £94.4 billion1, a record high. With this strong dividend growth set to slowdown, William Meadon, manager of the JPMorgan Claverhouse Investment Trust, explains how investment trusts can provide investors with a level of income certainty. The UK’s strong dividend growth reflected significant increases in payments from mining companies, sterling’s weakness and a plethora of special dividends. However, even excluding special payouts, underlying dividends grew at the fastest rate since 2012, with miners accounting for nearly half the increase—for example, Rio Tinto1 sharply increased their dividend and Glencore2 paid its first dividend since August 2015. Weaker sterling was broadly beneficial for dividend growth, given approximately 40% of UK dividends are paid in dollars3. Strong growth in dividends from mid cap companies also provided a boost, with mid-cap dividends rising significantly faster than the FTSE 100 (14.6% vs. 10%)1, helped particularly by generous distributions from housebuilders and leisure stocks. The strong rise in dividends last year is unlikely to be repeated this year. 2018 dividend growth is likely to be more sluggish for at least two reasons—the rebound in the sterling exchange rate and the likely drop in special dividends. As of the end of January, sterling is already 10% higher against the dollar compared to the average rate for 20173. With 40% of UK dividends paid in dollars, we believe the currency alone—at a current exchange rate of $1.41—will take 4% off 2018 dividends. Meanwhile, special dividends are also likely to be less plentiful in 2018, hit by an expected slowdown in the domestic economy and by uncertainty over Brexit, with the UK now only just over 12 months away from leaving the European Union. Investors concerned about a slowdown in dividend growth might want to consider investment trusts. Investment trusts are able to tuck away up to 15% of their income, in any one year, into revenue reserves, which provide a pot of money to pay dividends from in more difficult times. 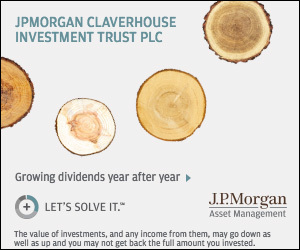 By occasionally utilising its revenue reserves, JPMorgan Claverhouse Investment Trust has increased its dividend for each of the last 45 years and recently announced a 13% increase in its 2017 dividend to 26p per share4. Even after such a substantial increase, the company added further to its reserves, which now stand at more than a whole year’s dividend—the highest in the UK income closed-end fund sector. This substantial reserve will provide a very significant safety buffer in more difficult times and gives greater certainty to the payment of future dividends. The consistency of investment trust dividends compared to the volatile income from the UK market alone is shown in the charts below. Investors looking for greater security of equity income might therefore want to consider including some investment trusts, with large revenue reserves, in their portfolios. 1Source: Link Asset Services UK Dividend Monitor Issue 32 – Q4 2017. 2Source: Glencore as at 1 December 2016. The companies above are shown for illustrative purposes only. Their inclusion should not be interpreted as a recommendation to buy or sell. 3Source: Bloomberg as at 31 January 2018. 4Source: J.P. Morgan Asset Management as at 31 December 2017. Investment Objective: The Company aims to provide a combination of capital and income growth from a portfolio consisting mostly of companies listed on the London Stock Exchange. The Company’s portfolio consists of between 60 and 80 individual equities in which the Manager has high conviction. The company has the ability to use borrowing to gear the portfolio within the range of 5% net cash to 20% geared in normal market conditions. Key risks: Where permitted, a trust may invest in other investment trusts that utilise gearing (borrowing) which will exaggerate market movements both up and down. For income funds/shares Dividend income is not guaranteed and will fluctuate. This fund may use derivatives for investment purposes or for efficient portfolio management. External factors may cause an entire asset class to decline in value. Prices and values of all shares or all bonds could decline at the same time, or fluctuate in response to the performance of individual companies and general market conditions. This trust may utilise gearing (borrowing) which will exaggerate market movements both up and down. This trust may also invest in smaller companies which may increase its risk profile. The share price may trade at a discount to the Net Asset Value of the company. The single market in which the Trust primarily invests, in this case the UK, may be subject to particular political and economic risks and, as a result, the trust may be more volatile than more broadly diversified trusts. Where permitted, a trust may invest in other investment trusts that utilise gearing (borrowing) which will exaggerate market movements both up and down.